George Washington, “George Washington to Daniel Carroll of Duddington,” Histories of the National Mall, accessed April 22, 2019, http://mallhistory.org/items/show/464. In 1791, Daniel Carroll of Duddington, a District resident, was in the middle of an argument with Pierre Charles L'Enfant, city planner for the new capital. Carroll had built a house where L'Enfant wanted a road, but Carroll was reluctant to have it torn down. 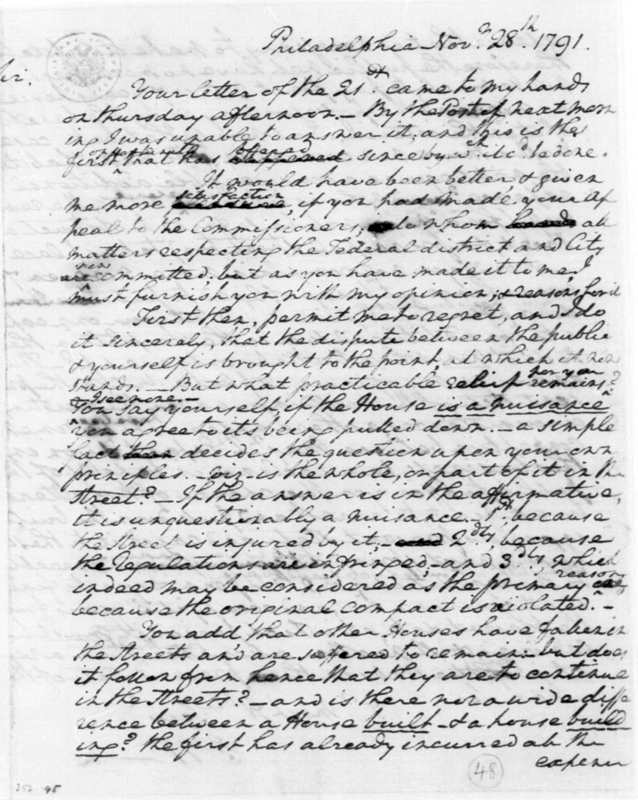 Washington wrote to convince Carroll to move the house, at federal expense. What Washington did not know was that L'Enfant had already torn down Carroll's house a few days before. 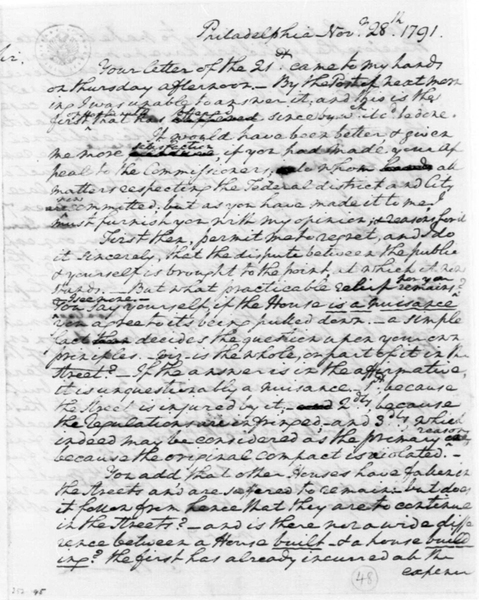 George Washington Papers, American Memory, Library of Congress. View original. Your letter of the 21st came to my hands on thursday afternoon. By the Post of next morning I was unable to answer it; and this is the first opportunity that has offered since by wch it cd be done. It would have been better, & given me more satisfaction, if you had made your Appeal to the Commissioners; to whom all matters respecting the Federal district and City are now committed; but as you have made it to me, I must furnish you with my opinion; & reasons for it. First then, permit me to regret, and I do it sincerely, that the dispute between the public & yourself is brought to the point, at which it now stands. But what practicable relief remains for you? I see none. You say yourself, if the House is a nuisance you agree to its being pulled down. a simple fact decides the question upon your own principles—viz.—is the whole, or part of it in the Street? If the answer is in the affirmative, it is unquestionably a nuisance. 1st, because the Street is injured by it; 2dly, because the regulations are infringed; and 3dly, which indeed may be considered as the primary reason, because the original compact is violated.